Like Thomas McCarthy's 'The Visitor', Neil Jordan's 1991 film 'The Miracle' is bursting with unspoken feeling and intense yearnings, and traffics in a kind of emotional currency that's too uncomfortable, or perhaps just too subtle for a lot of people. And like 'The Visitor' few people actually saw 'The Miracle'--now the film isn't even on DVD, a real shame--this is a perfect candidate for the Criterion Collection treatment. It's not a film that should be encapsulated but rather experienced--I will say it's about the pull and danger of imagination and storytelling, and the pain and liberation of discovering, at last, the truth behind deeply buried family secrets. It's also very much about music as a potent communication of things unspoken, as in this scene with a luminous Beverly D'Angelo singing 'Stardust'. Now, I post this 80s classic without the detached, ironic, blank posture that afflicts the hipster community as described in horrified detail in Adbusters here. These hipsters have helped keep all this 80s music in the cultural mix long past when I, who was a teenager the first time it rolled around, would have imagined. In 1984 there was a sharp divide between bubble gum pop and hair metal, and the cool stuff like Bowie, X, The Smiths and The Talking Heads. Pop was a guilty pleasure at best, insipid and grating at worst. Sometimes those two aspects overlapped, of course. See: Madonna. But the synth heavy hits that MTV persuasively sold with narcotic visuals felt trifling even if they were catchy, and I figured history would soon discard them, along with my adolescence. But after a brief respite in the 90s bars and parties welcomed Corey Hart and Pat Benetar and post-Fleetwood Mac Stevie Nicks back with open skinny arms, creating a bizarre musical Groundhog Day for those of us who lived through it all the first time around. A lot of catchy tunes, to be sure, but the layer of froth on top relegates much of it to mere nostalgia. Then I discovered Eli Escobar, who may be rewriting musical history and redeeming an entire decade. DJ and remix artist Escobar strips these glossy pop concoctions of that synthesizer pulse that, too me, dates the material badly, and he brings the beat forward, crafting a more timeless, and certainly a more funky version of the original. I first heard his work on this insane mix of Janet Jackson's 'The Pleasure Principle', where he used the existing beats like a weapon against the keyboard hum that undermined the radical edge that drove the Jimmy Jam & Terry Lewis produced jam--making it harder, stranger and certainly funkier. On Stevie Nick's 'Stand Back' he's outdone himself--the 7:46 verion here is tight, driving, fresh--he keeps the signature synthesizer hook but anchors it with a tighter, angrier beat and bassline. All these 80s artists should just commision Escobar to go back and remix their stuff, peeling away the sacharine icing and revealing the true song, and the true beat, beneath it. Escobar DJs Wednesdays at Bang! on Rivington Street in NYC; his website with other cheese--and irony--free remixes is here. Just saw this Charlize Theron perfume spot for the first time-pretty hot. Love how voluptuous she is, and the choice of music is inspired. Marvin Gaye's 'A Funky Space Reincarnation" is from his dark, strange, seriously funky "Here My Dear". The story is that when he got divorced (from Berry Gordy's daughter) he was broke, so the judge decided that all the profits from Gaye's next album would go to her. A pretty good deal, except that Gaye put out a very non-commercial, fairly gloomy album that was all about the break up and the judge, an elaborate kiss-off explained in intricate detail. It's Gaye's 'De Profundis'. It didn't sell many copies, which was part of the plan. The upside to the story is that it's one of Gaye's most uninhibited albums, super confessional and very jazzy and live-sounding. You can hear "A Funky Space Reincarnation" at lala.com from the link below. It's the new online music store I'm very into. One of the virtues is that you can listen to any song all the way through before you decide to buy it or not. In fact, you can listen to entire albums from start to finish once. The downloads are DRM-free too. An Afro-American version of the James Bond credit sequences, the driving Willie Hutch title track, and Miss Pam Grier. After I told him Vampire Bill was my ideal man my roommate reminded me of something he'd texted me very late one night--that what I needed was a big man to hold me. When I came across Joe Gordon-Levitt's version of 'Express Yourself' this morning and caught a similar line in Madonna's lyrics. After a late night viewing of the wonderfully laconic 1954 French gangster movie "Touchez pas au Grisbi" at my friend's organic burrito joint in Key West a couple weeks back, another guest sent me a link to a Google Image search results page. 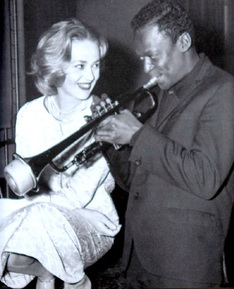 It was for 'Grisbi' co-star Jeanne Moureau, in '54 a fiery ingenue in a small part, but the search turned up a page full of shots of Moureau with Miles Davis like this one on the left). He IMed me the link the the image page, and I asked if he had discovered "Elevator to the Gallows", another French crime movie that, four years later in 1958, was even more world-weary and naturalistic, and a significant transition point towards the morally open-ended sensibility of the French New Wave that would come to full bloom a few years later. Nick didn't register the film, had only seen these images of Moureau and Davis and thought they were cool-they certainly are, two artists, both the epitomes of their respective cools. But I imagine they met through "Elevator", as Davis did the moody, gorgeous soundtrack and Moureau, then 30, was the female lead who wanders around Paris all weekend looking for her lover-a lover who is at this moment caught, mid-heist, in a broken elevator in a building that will be empty until Monday morning when his crime will be discovered. I'm so overwhelmed with projects that I've been super remiss on keeping Meerkat current-look to see that change next week. Three days late, here's a Friday Music Cue: 'Bonjour Tristess' by Juliette Greco, from the 1958 Otto Preminger film. Just saw BT for the first time and found the poor little perky rich girl played by Jean Seberg to be decidely annoying, and her near incestuous relationship with her dad (David Niven) dark but unexplored. A truly terrible job of looping Seberg's dialogue cast the character in an even less sympathetic light. For a movie set on the French Riviera that stars Seberg, Niven and Deborah Kerr to leave me cold takes some doing. Great intro section here though with Greco's song, and Seberg's (or whomever's) zombiefied voice actually works in the context of these lines. The Bloodstone track is now indelibly fused with this scene from "Jackie Brown" for me.